BUY 7' VINYL AND DIGITAL HERE: http://dubgabriel.bandcamp.com/album/dub-gabriel-feat-ranking-joe-7-vinyl DAC20-7” Dub Gabriel feat. Ranking Joe Limited Edition of 500 Hand Numbered 7” Vinyl & Digital A. Freedom Fighter B. 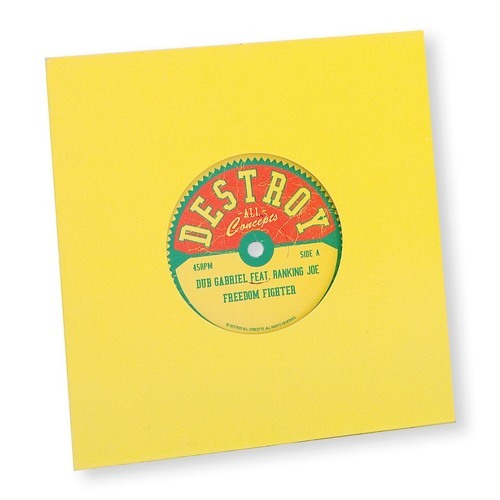 Freedom Fighter (RSD Roller Dub Mix) Dub Gabriel returns with his 3rd release of his 7” vinyl series, this time with a true reggae legend, Ranking Joe! With over a 40-year career, he has solidified his legacy in the history of reggae working with such giants as Studio One, Sly & Robbie, Greensleeves, King Tubby, Trojan and many others. We are also honored to have another legend on the Dub Remix B side, none other then the great RSD (Rob Smith from Smith & Mighty). His work through the years has defined the sound of Bristol and beyond and continues to redefine the sound of Raggabass to future generations. Mastered in London by the legendary Kevin Metcalfe and pressed on thick hi quality 7” vinyl, this is a ltd. edition, hand numbered & stamped series of 500 and will also be available digitally.